Wars of the Roses (1455-1485) - A civil war over the crown of England between two branches of the ruling Plantagenet family. 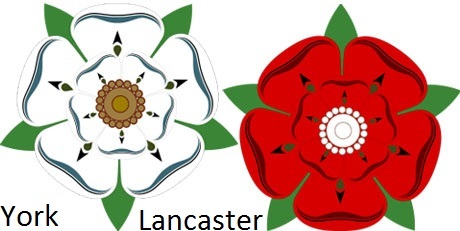 The two sides, known respectively as the House of York and House of Lancaster fought for thirty years. The origins of the war are so complex, I doubt even the participants understood them. On the other hand, it makes complete sense. Multiple people wanted to be king, but only one of them could be. For simplicity sake, let's just say that the monarchy began to fracture after the long reign of Edward III. His immediate heir, Edward IV (the Black Prince), died before his father, and succession passed to Edward III's grandson, Richard II. Only ten years old when he became king, Richard was kept under the close supervision of his uncle, John of Gaunt, Duke of Lancaster. John of Gaunt was Edward III's fourth son. His son, Henry of Bolingbroke usurped Richard in 1399 and became Henry IV. He was succeeded by his son, Henry V, in 1413. The House of Lancaster seemingly had a solid grip on the throne. But Henry died in 1422, leaving his one-year old son, Henry VI, king. In time, Richard, Duke of York, questioned the legitimacy of young Henry's reign. Richard was the grandson of Edmund of Langley, who established the House of York. Edmund was Edward III's fifth son. This began the split among the Plantagenets for control of the British crown. Henry initially fended off Richard's challenge, but in August 1453 he went mad. Modern analysts believe Henry suffered from schizophrenia causing him to lose focus with reality. This brought another challenge from Richard. Henry's wife, Margaret of Anjou, proved to be a major player in this power struggle. She tried to become regent and rule while her husband was out of commission. But in February 1454, Parliament appointed Richard 'Lord Protector' of England (two centuries before Oliver Cromwell held that title). In December of that year, Henry returned to his senses and Richard was demoted. But Richard was not ready to give up power. There's a quote by historian Robin Storey which goes, "If Henry's insanity was a tragedy, his recovery was a national disaster." Once again, Margaret of Anjou stepped in and tried to preserve the monarchy for her newborn son, Edward of Westminster. In May 1455, she convened a great council in Leicester and pointedly excluded Richard and the entire House of York from attending. Richard considered the move a slap in the face and hostilities immediately broke out. The next day he marched an army toward London. The king's army, led by Edmund, Duke of Somerset, caught up to it about twenty miles north of the city at a town called St. Albans. 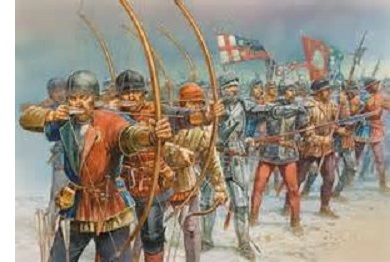 There the First Battle of St. Albans was fought. Neither army was large; Richard's about 3,000 men and the king's about 2,000. It began with negotiations; but after several hours, Richard became impatient and gave the order to attack. The king's army was taken by surprise and routed, and Edmund of Somerset was killed in the fighting. It's likely his men never expected Richard to attack. But he did, and won the opening battle. It was not a big battle, but it marked the start of the war. Meanwhile, King Henry slipped back into delusion (perhaps as a result of losing the battle). This actually halted the conflict (for awhile). Richard was once again appointed Lord Protector while Henry's mind was gone. Richard wasn't interested in war, just power. So while he had it, there was peace. He appointed people to positions that might help him retain power in the future. But Henry recovered once again in February 1456 and regained full authority. He replaced Richard's appointments with his own. The two sides, York (under Richard) and Lancaster (under Henry and Margaret) maintained an uneasy peace until September 1459 when the Battle of Blore Heath was fought. In the three and half years between, the two houses spent their resources building up their forces. It was a marginal victory for the Yorkists, but a short-lived one. The following month, they were defeated at Ludford Bridge. Richard retreated to Ireland, beyond Henry's reach, and regrouped. In the summer of 1460, the Battle of Northampton was fought. The Yorkists were victorious, but more importantly, they captured the king. The next day, the Yorkists marched on London where Richard tried to declare himself king in front of Parliament. But the move shocked its members, even those who supported York. So Richard backed off the attempted power grab and instead made the case for his legitimacy over Lancaster's. Records were produced showing the genealogies of the two houses and it was decided by Parliament that York had the stronger claim. However, a compromise was reached. It was called the Act of Accord. Henry would remain king, but his son, Prince Edward was disinherited. York would succeed him as heir to the throne. York accepted the compromise. But Margaret of Anjou did not. She retreated to Scotland and employed the assistance of Mary of Gueldres, Queen Consort of King James II of Scotland. Scotland, England's old adversary was all too happy to keep the civil war alive and provided the queen with an army. And she made good use of it. On December 30, 1460, the Lancastrians defeated the Yorkists at the Battle of Wakefield; and Richard, the man who would be king, was killed. Lancaster had hoped that this would end the war in its favor; but Richard had an 18-year old son, Edward, Earl of March, who was ambitious enough to step into his father's shoes. He became the new Duke of York and claimed succession under the Act of Accord. Barely a month after Wakefield, he defeated the Lancastrians at the Battle of Mortimer's Cross. He then marched on London and proclaimed himself King Edward IV. On hearing this, Henry and Margaret declared that he had violated the terms of the Act of Accord (which was that York could not assume the throne while Henry was alive), and therefore, had forfeited his right to be king altogether. The matter could only be settled, once again, through force of arms. It took place at the Battle of Towton on March 29, 1461, in what would turn out to be one of the bloodiest conflicts ever fought on English soil. Both sides agreed beforehand that the outcome would settle the matter once and for all. About 60,000 soldiers fought, with Lancaaster having a slight edge in numbers. When it was over, at least a third, and probably closer to a half of the men had been killed. But the deaths were not equally divided. York had won a clear victory. Henry and Margaret fled to Scotland and Edward ruled uninterrupted for the next nine years. However in 1470, with some help from the King of France and the Earl of Warwick (a former ally of York), Edward IV was deposed and Henry VI restored to the throne. It only lasted six months. On May 4, 1471, the decisive Battle of Tewkesbury was fought. It ended in victory for York, resulted in the death of Prince Edward of Wales (the one for whom Margaret was trying to preserve the throne), and reduced Margaret of Anjou to irrelevancy. Henry VI died only weeks later (whether murdered or of natural causes is not entirely certain). Thus ended the first phase of the Wars of the Roses and led to peace until Edward's own death in 1483.